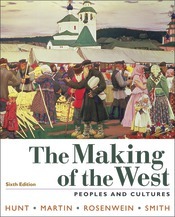 The Making of the West features a chronological narrative that offers a truly global context and tells the story of the cross-cultural exchanges that have shaped western history. This brief book includes a full-color map and art program and comprehensive supplement options. The result is a brief book that is an excellent price and an outstanding value.